As a haematologist’s daughter, the terms ‘leukemia’ and ‘remission’ floated fairly frequently through the house. I didn’t quite understand them to begin with except that there were frequent phone calls, stories of children who had come to be examined at the Institute and the haunting tale of a patient who had been told by a psychic that everything would be all right who stopped all treatment despite protests from my father and who finally died, so presumably he was ‘all right’ in the sense that he was free from all physical ills. Later, without being asked, I heard stories about bone marrow transplants and spine taps and how painful it was for children. Leukemia, I gathered was an incurable ill that could only be fought with whatever tools there were at hand while researchers frantically sought to evolve a cure. What he set out to do was to document the mind of cancer, the elusive malignant ‘shape shifter’. “If we seek immortality,” Mukherjee writes, “then so, too, in a rather perverse sense, does the cancer cell.” Cancer strives to reproduce to defend itself against all attacks by changing shape and location with incredible rapidity. The earliest reference to the disease is found in ancient Egypt, recorded by the physician Inhotep who described it on a papyrus dating from 1600 BC with the precision with which he described all medical observations: “a bulging tumour . . . like touching a ball of wrappings.” And where Inhotep had treatments for all the medical conditions written down in this case he wrote: “none.” For more than 2,000 years after that, cancer was barely touched upon in medical literature. Our modern understanding of cancer began in the early 19th century when it was discovered that all plants and animals are made of cells and cells are born from other cells. Mukherjee starts his narrative with the story of Sidney Farber, the founder of the hospital where he trained. Farber was obsessed by acute lymphoblastic leukemia and the way in which it destroyed apparently healthy children within a few days. In 1947 Farber managed to successfully use an experimental drug, aminopterin, which had the child walking, talking and moving again – not a cure but that word ‘remission’ which I had become familiar with over time. For Farber that remission aroused the hope of finding what another researcher described as ‘a penicillin for cancer’. What Mukherjee does is tell the story of cancer and the various wars waged against it. Mary Lasker, for example, whose efforts against cancer managed to persuade Nixon to make the National Cancer Act law in the US or Farber himself who managed to start a research fund by using one of his patients as an icon, a blonde youngster he rechristened Jimmy. 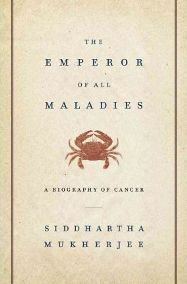 From Halstead’s radical surgical procedure which deprived women of breasts and practically anything else in that part of the body in an attempt to root it out altogether, to the development of palliative care which many oncologists looked on as an admission of defeat, the Emperor of all Maladies covers amazing discoveries as well as moments of defeat. Cancer surgeons “pumped up with self-confidence, bristling with conceit and hypnotized by the potency of medicine, oncologists pushed their patients — and their discipline — to the brink of disaster,” Mukherjee writes. Smoking gave cancer new teeth – Mukherjee accurately documents the propaganda efforts “the proverbial combination of smoke and mirrors” carried out by the cigarette manufacturers, and says that like cancer, smoking was the product of modernity, though here it is worth noting that Mary Lasker’s husband Albert executed several successful campaigns for Lucky Strike cigarettes. For readers the book is a sometimes fearful coming to grips with the enemy resulting in a certain understanding of the situation. Mukherjee does not offer false hope. According to him, oncology is “the queasy pivoting between defeatism and hope.” But yes, there is always a chance of return from the ‘kingdom of ill’. And there is always the hope of a breakthrough like the possibility of dawn. 5 Comments on "Mapping Malignancy"
Thank you so much for this. I am about to buy this book. A question – if I go to Amazon from this site, does that help you? Thanks for helping us stay above the water. And won Guardian’s first book award!